"I sat down and watched as water rushes down like million furious horses scamper towards their destiny"
Just two days after the onslaught of typhoon "Mario" (international name "Fung-Wong"), i decided to visit Tangadan Falls on its fully loaded state and see the Kilat Falls along the way. My plan was to ride a tricycle up to sitio Kilat and walk my way up but i changed my mind and rode a passenger motorcycle all the way up to nearest drop-off point to Tangadan Falls. I bought bananas at San Gabriel public market as my "pack lunch". Rode a passenger motorcycle (9:40 am), passed by sitio Kilat, sitio Siwsiwan until we arrived at the drop-off point where there was a waiting shed (10:18 am). The motorcycle cannot go further down because of the steep, mossy, slippery downhill road. The driver will also just wait for me in that area to bring me back to downtown San Gabriel after i will come back from the Tangadan Falls. From there, I walked my way down on the still moist mossy road. It was slippery that I carefully walked my way down. Thanks to a small concrete humps at the side of the road that served as little steps. Where there were no small concrete humps, I walked on the bare soil at the sides of the road which was safer. one of the final stretch of concrete road going to Tangadan Falls area. because of the moss that covers the surface specially at the steep portions. Because it's rainy season, there were some few springs along the way and not to mention the branches and leaves scattered by the recent typhoon. On my way down at the mountain side, I can see a small waterfall cascading near where Tangadan Falls is located. I reached the river at around some few minutes before eleven o'clock. There it was, Tangadan Falls in its fury. After some few minutes, I went back on the trail and left Tangadan Falls (11:54 am). Going up on the mountain side trail was no walk in the park. I had many stop over to rest and catch some breathe. I finally arrived at the drop-off area (12:56 pm) where there was a waiting shed and where the passenger motorcycle was waiting. I rode back on the passenger motorcycle and went down the road to sitio Kilat to see another waterfall called Kilat Falls. Along the way, the driver and I conversed a lot. "Idi kalman ada pay intulod ko dita Tangadan, naka motor da ti dadakkel. Taga Manila da" (Yesterday, I guided some people to Tangadan. They have big bikes. They are from Manila) the driver said. "Nagpintas pay diyay camera da ta uray mabasa okey lang" (Their camera was great because it was okay even if it gets wet) he added. Knowing that, I think I recently knew one of them from facebook and added him as a friend. We arrived at sito Kilat by the riverside where I went down to see Kilat Falls at the other side of the river. After taking some photographs and videos, we went back to downtown San Gabriel where I rode a jeepney going back to Home Sweet Home. 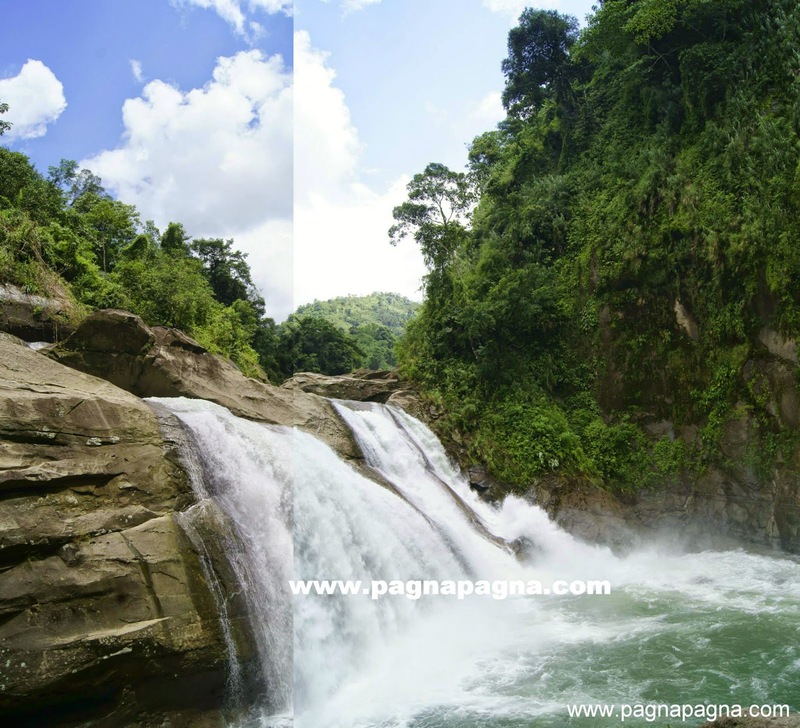 Video of Tangadan Falls during rainy season. 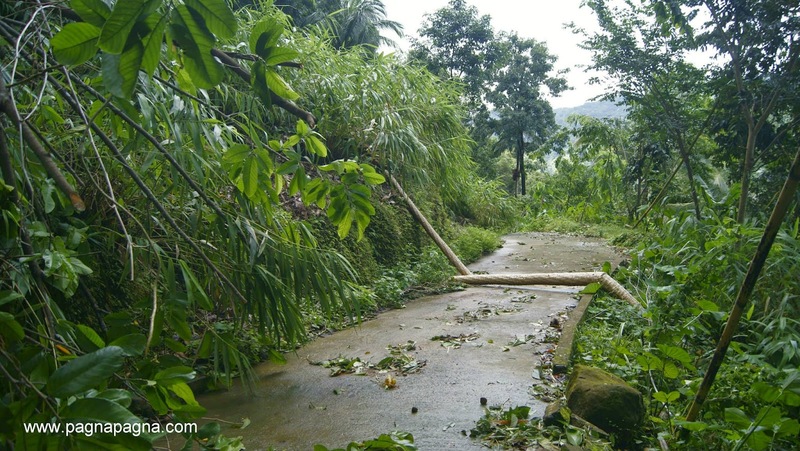 In this case, 2 days after typhoon "Mario"
Video of Kilat Falls during rainy season. Two days after typhoon "Mario". There are also an announced and rumors of celebrities visiting the place (contributing to the crowd increase). From Manila take a bus bound to any of these: Laoag, Vigan, Candon, Abra but get down to any of these places in La Union namely: San Fernando, San Juan or Bacnotan . Then from there get a jeepney bound for San Gabriel. Ask where is Kilat falls, it is just nearby. To Tangadan Falls, get the uphill road going to barangay Amontoc and when you reach a point where the road ends ask for directions going down to the falls (there are only one or two houses there) . 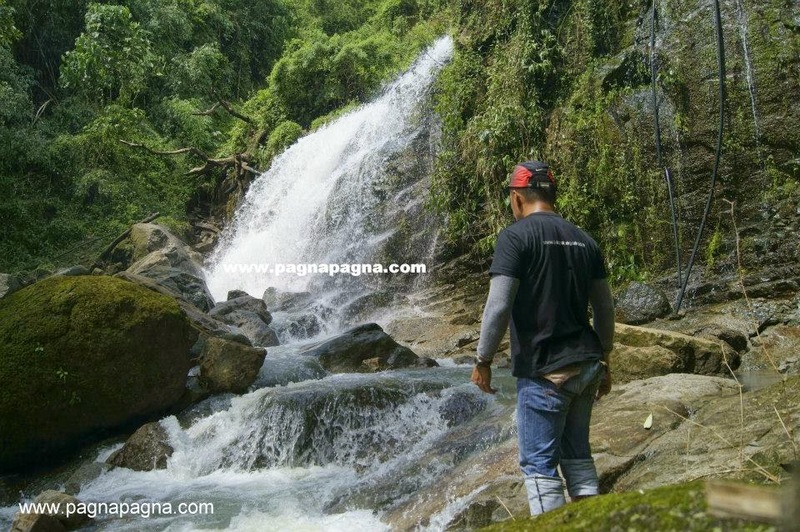 -At downtown San Gabriel, you can also get a Backseat ride on a single motor bike up to the drop off point (end of the road or wherever the road is passable) then take some 15 minutes or more downhill hike to the falls below. 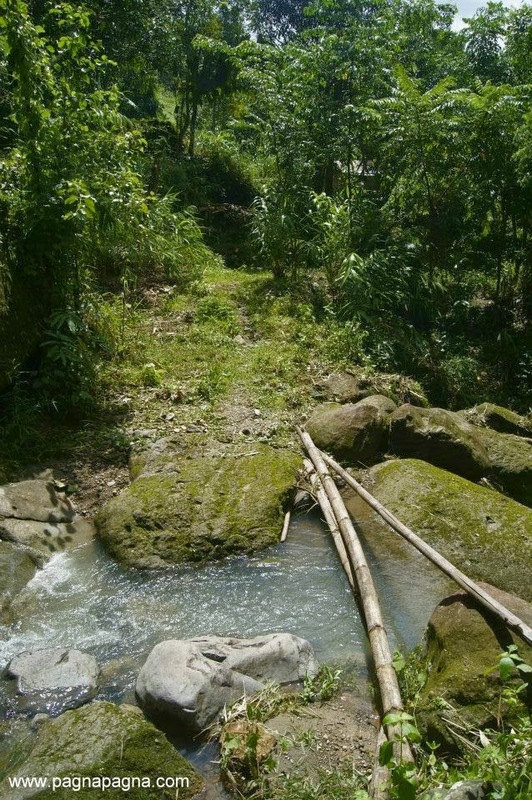 (recommended for summer hike, dangerous during rainy season)-This is a faster way but have to walk along rocky riverside and sometimes crossing the river at knee deep depending on the season (rainy season-deeper river and may not even be passable). 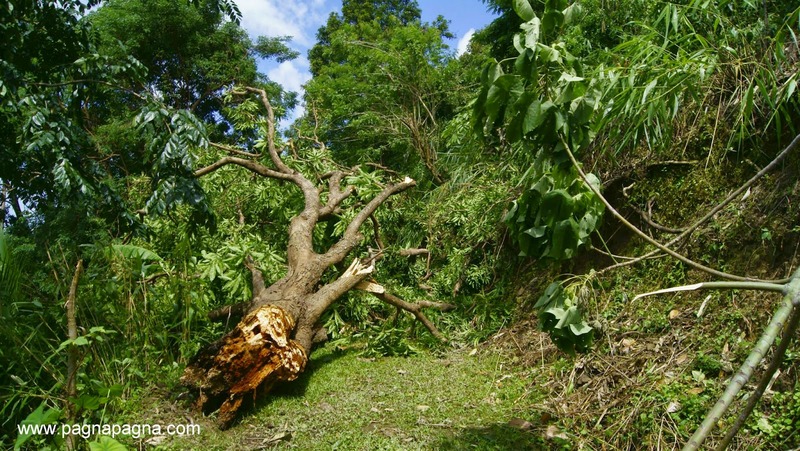 From downtown San Gabriel, hire a tricycle to bring you to Duplas which passes through barangay Bucao (just tell them you are going to the drop-off point to Tangadan Falls at barangay Duplas -upper) near Dagup. You may ask for direction there and hike your way to the waterfalls along the river for about 1 hour to 2 hours. Note: You may also visit the San Gabriel, La Union Municipal Hall for more inquiries.